The Student Support Department at Holy Trinity School is committed to inclusive practices and acceptance of individual difference. Our mission is to develop the individual potential of students within a collaborative, supportive environment. Student Support promotes understanding of the individual and believes that all students, irrespective of disability, have the right to learn in the least restrictive environment. The role of Student Support is to support students with disabilities and students with learning difficulties within the regular classroom setting and to work with small groups and individuals in the Student Support Centre, which is affectionately known as the 'Purple Room'. Once student needs are identified Student Support becomes a link to communicate with parents, teachers and outside agencies regarding the needs and progress of this student. Education Assistants support student learning in the classroom and the Student Support Centre. 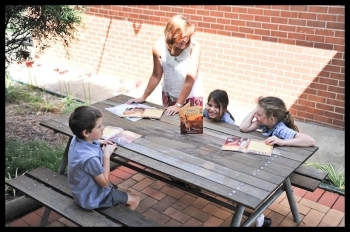 Two Aboriginal Education Assistants support the classroom teachers in achieving the best possible education outcomes for Indigenous students and foster the understanding and knowledge of all students of Indigenous cultures. As well as promoting cultural understanding, they support student learning by liaising with the local indigenous community. Students who have a first language other than English are also supported within the classroom through the Student Support Department. ESL education aims to assist students whose first language is not English to become sufficiently competent in their use of English to take an effective part in mainstream Australian social and educational activities.